Binoculars are one of the basic tools you should have with you when going out onto the water. In the very least, it’s a convenience, and many times a necessity – depending on what sort of boat you are in and where you are going. Unlike on land, where you typically can’t see very far because of obstacles, out on the water things tend to be far away – this includes the shore, buoys, landmarks and other vessels. 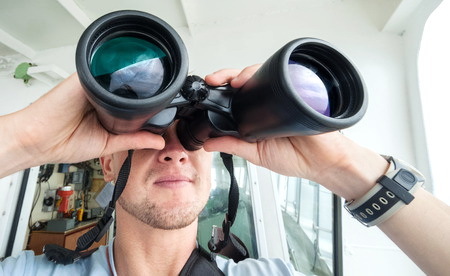 In order to be able to see various markers, as well as the movements and signals from other boats and ships, the naked eye is often not enough and you will need some magnification, which is why you should get yourself a good pair of binoculars. This Steiner binocular is most certainly one of the best marine binoculars you can get, especially in that price range. Steiner is well known for making superb optics and this one is no exception – you can expect the image quality to be stunning. Due to their large objectives and coated optics, you will get brighter images at dusk than you will get with the naked eye. And this is important – when you’re in a boat during twilight, you want to be able to identify and track anything that’s not water quickly and with ease. Steiner specializes in making optics for the marine and the military – the two environments that require both excellent optical performance as well as durability. 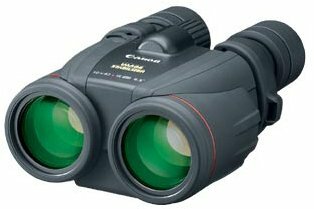 These 7×50 binoculars are about as rugged as fine optical instruments can get and they’re built to withstand a lot of abuse, which is not uncommon when boating. It’s easy to bump your binos while thrashing around the boat or when a bigger wave takes you by surprise. They’re not afraid of any spray or even being dropped in the water, as they’re totally waterproof. They won’t float by themselves though, but you can get a floating strap from Steiner for that purpose. Another nice feature particularly for the marine environment is that these are so-called “auto-focus binoculars”. What this means is, you adjust the individual diopter knobs for each eye and after that everything beyond 20 feet will be in focus permanently. This trick is achieved by using your eyes’ natural ability to focus on objects. This is very convenient for being able to use the binos quickly as soon as needed – just point them in the right direction. They are perfect if you want to catch a glimpse of the marine wildlife such as whales and dolphins. 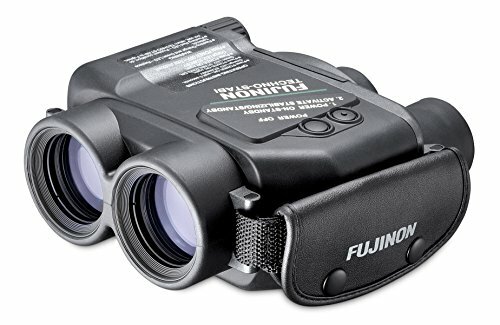 The downsides of this feature is that you can’t just pass these binoculars to somebody who has significantly different vision from yours – they’ll need to adjust focus – and that anything closer than 20 feet is permanently out of focus: you can’t really use them to watch bugs in your backyard. You don’t have to believe me regarding the quality of the view and the ruggedness that these binoculars provide. Go have a look at the reviews by other users on Amazon and watch them sing praises to this Steiner model. For the price, it’s really hard to get your hands on a product of this quality that’s been built specifically for use on the sea. Having seen one excellent buying option, let’s go through the essentials that you need to understand when shopping for binoculars for your particular purpose. After that, I will outline several other products that you may want to consider. This is the most obvious of the parameters used to describe binoculars. Magnification determines how many times the image will be enlarged compared to looking at it with an unaided eye. Due to geometry, it also happens that this can be said in a different manner: if the magnification 10x, an object that is 500 yards away will look as if it’s 50 yards away. The most used and generally recommended magnification for marine use is 7x. Apparently, this is also the number recommended by the US Coast Guard, though I haven’t been able to find a specific reference for this. 8x is also perfectly fine, there isn’t that much difference between 7x and 8x. Going above that however, may land you into trouble. A boat on the water rolls and bobs up and down, making it difficult to hold the binoculars steady enough for a sharp image. The practicality of having very high magnification is also questionable: the more you magnify, the smaller your field of view. Typically, you want to maintain a decent field of view to be able to see the context of the object, the distance and scale. You’ll be able to find this value in any description of a binocular as the first number before an ‘x’, e.g. 7×50. The objective lenses are located at the front of binoculars and are the part that takes light in. Naturally, a bigger lens takes in more light than a small one. This results in more brightness in the final image that goes into your eye. Being able to use your binos in low light conditions, such as in the evening, at dusk or before dawn (and especially at night) is crucial because that’s when there’s the greatest chance of not noticing obstacles and other issues. So unless you are planning to do only daytime cruising/sailing/fishing etc, make sure to get optics with plenty of light gathering ability. Most marine binoculars will have 50mm lenses. This number is shown after the letter ‘x’ in a product description. You’ll notice that most marine binoculars are 7×50, meaning 7x magnification factor and a nice big 50mm lens. 42mm is generally also fine, as long as the optics are of high quality. The two numbers discussed above give a third one, called the exit pupil. This is basically the diameter of shaft of light that exits the eyepiece and goes into your eye and you can calculate it by dividing the object lens diameter by the magnification. A bigger lens results in a bigger exit pupil, whereas magnification decreases it. The exit pupil is important for understanding how well the binoculars will perform in dim light – you should go for at least a 5mm exit pupil for the binoculars to be useful in marine situations. If you wear glasses, eye relief is a particularly important consideration for you. This is the maximum distance you can keep between your eyes and the eyepiece without losing any part of the view. Eyeglasses need extra space in front of your eyes, so make sure to check that your chosen product offers at 15mm of eye relief. Another consideration is whether it’s possible to adjust the eyecups to make extra space needed by spectacles. Typical options are either rubber eyecups that can be rolled down, or twist-up eyecups. The former are usually quite inconvenient to use, especially if your binoculars switch hands often. They can also become stiff over time and crack. However, they are often shaped such that they follow the contour of your face and block light from the sides, making for better viewing, so many high-end models actually use these. Twist-up eyecups are, on the other hand, very easy to use and last longer. Modern binoculars can be divided into two large groups based on the type of prisms that they use. The prisms are located inside the barrels and are there to turn the image upright – otherwise you would see everything upside down (sidenote: telescopes often produce inverted images – this is because they lack prisms). Porro prism – most marine binoculars tend to be of this type. You can identify it because they don’t have straight barrels. The barrel is thick near the objective lens and then there is a kind of step where the barrels narrow down before the eyepieces. The objectives are usually spaced far apart, further than the eyes. The focus is usually adjusted for the two eyepieces individually. Binoculars of this type are often bulkier and heavier, but they allow for big objective lenses. Plus, the wide separation of lenses creates a better depth of view, i.e. a deeper 3D perception which makes it easier to estimate distance and motion of far-off objects. Ergonomically, Porro prism binoculars are often not as comfortable to hold as their counterparts. Historically, Porro prism designs also had better light transmission, but this is not always the case anymore. Roof prism – these are the types usually used for things like birdwatching, hunting and as general purpose binoculars, though they are increasingly more popular with sailors, yachties and cruisers as well. 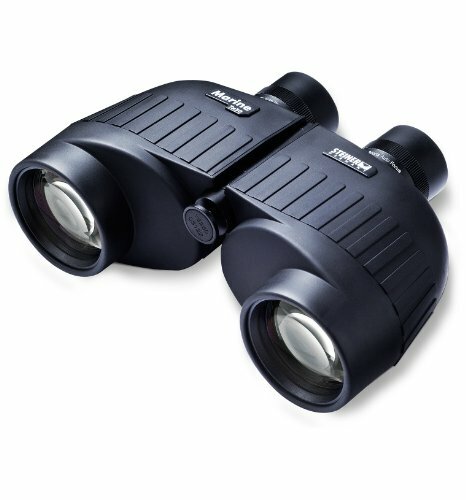 Roof prism binoculars have straight barrels, perhaps only slightly widening towards the front lenses. They are lighter, smaller and more comfortable to use. Typically, they also have a center focus knob, so you can adjust focus quickly. The technology in the recent years has improved so much that many roof prism binoculars offer image quality on par with Porros. Even though these are not traditional boating binoculars, I highly recommend looking into some options. After all, if your binocular is meant to be passed around and used by several people on the boat, then roof prisms will probably be more convenient and enjoyable without much sacrifice otherwise. Pretty much any binoculars above the basic budget level will have some sort of coating applied to lenses. The reason for this is that when light goes into a piece of glass, part of that light is reflected back and lost. The special coatings help reduce the amount of this reflected light and therefore increase the brightness and vividness of the image you’re getting. A binocular can have a lot of air-to-glass surfaces and each of those loses some light. Therefore, the number of such surfaces that are coated, the number of coating layers and of course, the technology and quality of the coating is one of the most important factors in the final optical quality of the binoculars. 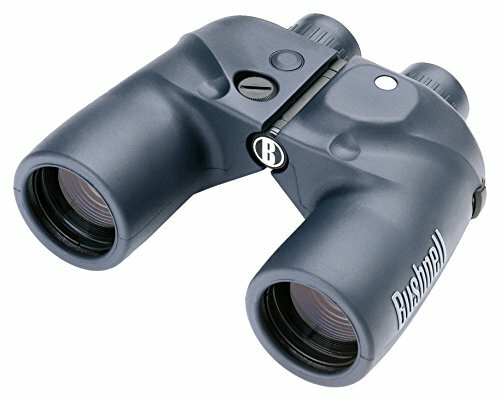 Look for binoculars that have fully multi-coated lenses. This means that all air-to-glass surfaces have multiple layers of coating applied to them. Waterproof and fog proof design – Water getting into the binoculars can decrease their optical qualities, cause permanent damage through corrosion and even render them unusable. Moreover, fogging up is major problem in a marine setting, due to moisture in the air and daily temperature changes. For these reasons, it is an absolute must that your binoculars be waterproof and also fog proof. Don’t even consider cheap non-proofed optics. Many models are nitrogen or argon purged, which further helps keep the moisture out and resist corrosion. Some products even float by themselves when dropped in water, but don’t buy binoculars just because of that feature – it’s not like you’re going to be throwing them in the drink all the time. ED glass – extra low-dispersion glass is good because is decreases something called chromatic aberration – a kind of rainbow of colors appearing near the edges of objects that you may have seen in cheaper optics. Compass – some marine binos have an in-built compass that you can see while looking through them. This is useful when you’re working with a chart and are trying to find your location and bearing based on distant landmarks or markers. Range finding reticle – this is also a little extra feature you’ll find on some boating binoculars. Through one of the barrels, you’ll see a scale, often both vertical and horizontal. Matching this scale with a distant object whose height (or width) you know, you can then figure out the distance to the object. The height of many known objects are shown on charts. The possible downside of having a rangefinder reticle is perhaps that it may be somewhat annoying when you simply want to enjoy the view, such as watch ocean mammals playing in the waves. Tough build – a boat can be a harsh place for delicate tools like binoculars. Pick ones that are known for being well-built with a protective rubber casing – this also helps against sliding around the deck or table when the boat rolls and with holding them with wet hands. Armed with this knowledge, let’s have a look at some of the best products on the market. Choose based on your requirements and your budget. If you are serious about boating and want the cream of the crop in marine optics, I suggest you have a look at the Commander series by Steiner. Yes, the price is not for every pocket, but if being at sea is a major part of your life, whether due to your job or perhaps a sailboat cruising lifestyle, then this product is something to consider. You get some of the best optics out there in a package that’s specifically designed for use on the open water. Essentially, the Commander binos are a far more advanced version of the Steiner product recommended at the beginning of the article. They have an integrated compass and a rangefinding reticle. The body is filled with pressurized nitrogen to keep out all moisture and they are built so as to be able to withstand significant impact. 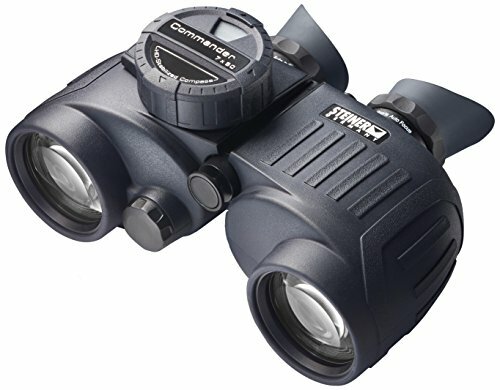 These binoculars come with both a floating neck strap in case they go overboard for a drink, as well as a carrying case. People who have bought the Commander generally consider that despite the price, they are a great purchase and that the quality of the optics is hard to match. In fact, in low light, the image that you get through the binoculars will not just be magnified, it will also be brighter than what you see with the naked eye. If your budget allows for this kind of a purchase, it’s definitely worth a consideration. This here is definitely not your classical marine bino. 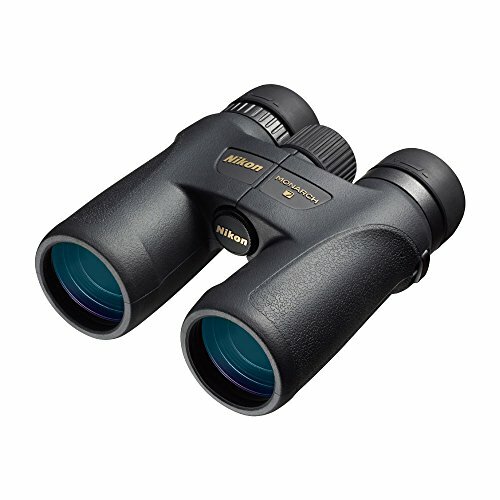 This is a roof prism binocular with 8x magnification and 42mm lenses. 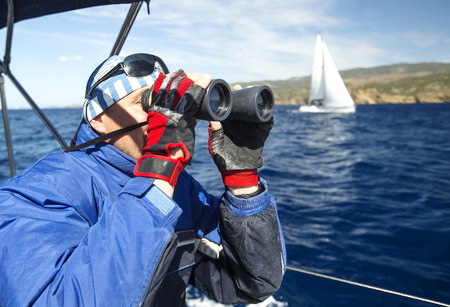 As discussed above, the great thing about having this type of binoculars on your boat is that they are light, relatively small compared to what you’d usually expect to have on board, have center-focus which is easy for several people to use, and have much better ergonomics than the typically big clunky Porro prism designs. Don’t let the slightly smaller lenses scare you: the light gathering capability of these Nikons is superb and they are actively used by nature enthusiasts, birders and hunters, who often need to see wildlife in the bush at dusk. They have all the fancy features you’d expect: ED glass, all sorts of coatings on glass elements, they’re nitrogen purged, waterproof and fog proof. They’re also housed in a nice rubber casing, they’re durable and easy to hold. Many sea-faring people have taken up roof prism binoculars due to their overall convenience and thanks to the technological improvements that have allowed them to mostly catch up with Porros in terms of light gathering and transmission. You’ll see them being used as fishing binoculars, especially for offshore fishing, and for yachting – essentially areas where the “going out to sea” is mostly for recreational and leisure purposes. It’s just less fun to mess around with huge marine binoculars when there are other options that get the job done. Now here is something different. Typically, I wouldn’t recommend using 10x binoculars on a boat or ship, because of the difficulty of keeping the view steady. This product resolves the issue, because it’s an image stabilized binocular. What it does is, by using electronics it can detect any shaking caused either by the waves or your hands and compensate for it by tilting a special lens inside the binocular. That way you get a much more stable image than you would with normal binos and so you can allow yourself to use them in situations you otherwise wouldn’t. And this is just 10x. Canon has products in its image stabilization (IS) range that go up to 18x (see here)! It can definitely be very useful to be able to see such detail, but of course it comes at the cost of field of view. 10x will be quite okay for general marine use, but if you get 18x for yourself, you should definitely have an “ordinary” 7x or 8x pair of binoculars onboard as well. You don’t expect your cellphone or camera to be waterproof, but this binocular actually is, despite having fancy electronics on the inside. As a side note, Canon has extensively used their expertise in making stabilizing camera lenses to produce this line of binoculars. For fairness and variety, I’ll also list Canon’s major competitor in the field of IS binos: the Fujinon Techno Stabi. 14x magnification is very impressive, and with the stabilization tech, you can actually make use of it even on a seagoing vessel. As mentioned above, you will probably want a normal bino as well for more general use. But the IS binos will be great for things like identifying far off vessels, or watching whales and dolphins play in the distance. If all of the products above seem like too much for and you want something simpler and also cheaper, then I’ll add this nice option. This Bushnell Marine here is a much loved model that is unlikely to let you down. Now don’t expect the same optical quality as from, say, the Commander above, but this Bushnell binocular still has good light-gathering capabilities and provides a sharp bright image. As usual with Porro design, the tubes can be focused individually – you are likely to have to do it only once for each eye. The build is sturdy with excellent grip and is made of water and corrosion-resistant materials. A nice thing about them is that they have this nice almost designer kind of look as opposed to the rather Spartan looking Steiner products. These will make a great item to take on a scenic cruise or for boating on your own – also for things like whale watching from a boat or ship. These binoculars are a great combination of features: they are not only waterproof, but they float. They also feature a compass, which is always useful on the water. Perhaps these wouldn’t be my first choice if I wanted to navigate heavily trafficked treacherous coastal areas at night, but they’re great value for the money for general boating, fishing etc. The general takeaway from this review article is that the quality of optical products is generally proportional to the cost. So everything depends on your requirements – working a tough marine job such as on a tugboat is very different from a leisurely fishing session on the lake – and of course, your budget. Decide how much you are willing to spend and then see which options are available in your price range.